S/V LAYLA: Splash -- Layla's in the Water! A journal of our voyages to far places . . .
Splash -- Layla's in the Water! After 1 1/2 years in the boatyard, Layla takes the plunge. The ‘to do’ list has finally dwindled to those tasks that will be addressed with Layla in the water. Layla was ready to go into the water. We scheduled the boat lift for 9:00 am. Before the lift arrived, folks from Beaufort Marine and our new friends from the boatyard, Mark and Kate, surprised us with a breakfast and gifts as we stood next to Adam’s Creek - the waterway we would soon travel to a slip we rented on Taylor’s Creek in Beaufort. Although this was only a short trip from the boatyard to the slip, everyone there knew this was nonetheless a big deal. After a year and a half “on the hard”, Layla was going in the water. Our friend Kate (left) and others from Beaufort Marine Center celebrate our departure with homemade strata, donuts, bagels, and tea. In the water, Layla’s engine started after the first crank. Layla purred. But, as Layla has always been a bit of a drama queen, within ten minutes, she protested with white smoke and then the engine died. We had a problem. Since we had asked our great cruising friend, Fred, to join us, we had added confidence that we could troubleshoot. The most likely culprit was contaminated the diesel fuel. We changed three fuel filters, and then re-learned how to “bleed” the lines. We had discussed cleaning the fuel and the tanks with various people before putting Layla in the water. Considering the cost and effort which would still demand that we would likely have to change filters and bleed the fuel lines anyway, we were talked out of the fuel cleaning. We started the engine once again and looked forward to about an hour and a half of motoring to the Beaufort waterfront. After about a mile and a half we checked our fuel consumption of the two fuel tanks and decided to switch to the starboard tank - Bad idea. Within two minutes the engine died. We dropped the anchor, and then removed the filters once again. After switching back to the port tank and the second filter, and bleeding the system, the motor started. We reasoned that we should simply turn around and get new fuel in the port tank rather than risking the chance of clogged filters/fuel lines again. About an hour later, we had filled the port tank and we were back on our way to putting Layla in her new slip. We expected an hour and a half cruise down the Intracoastal Waterway to Beaufort. It was a gorgeous day, even with the trip taking six hours. Fred and Bud enjoy the ride to Beaufort. All's well that ends well. The trip that should have been only about an hour and a half ended up being about six hours. Layla is a big girl with a wide beam and the slip was a tight fit. But it was quite a relief after a stressful day on the water. Layla was back in her element, and we were excited to see her there. Layla looks more at home here than in the boatyard. It didn’t take more than 24 hours for the weather to change, with a low pressure from the southwest bringing gusts up to 40 knots. After checking on her at 2 am and a fitful sleep, we knew we needed to find a better slip. Fortunately, the slip adjacent to us was available and about two feet wider. Within five minutes of maneuvering and line changes, Layla was snuggled in her new home. This was the slip for her. Now the new phase has begun. We are excited about what is next. Now when we see Layla on the water and in her slip, we can really see this is going to happen. Always an adventure on the water! She looks good. What's next? Please feel free to leave a comment. We would love to hear from you. Where in the World is Layla? Follow us as Layla takes us to far-away places. We are tracking Layla's position by satellite tracking. Click on the map above to go to Layla's MapShare site. 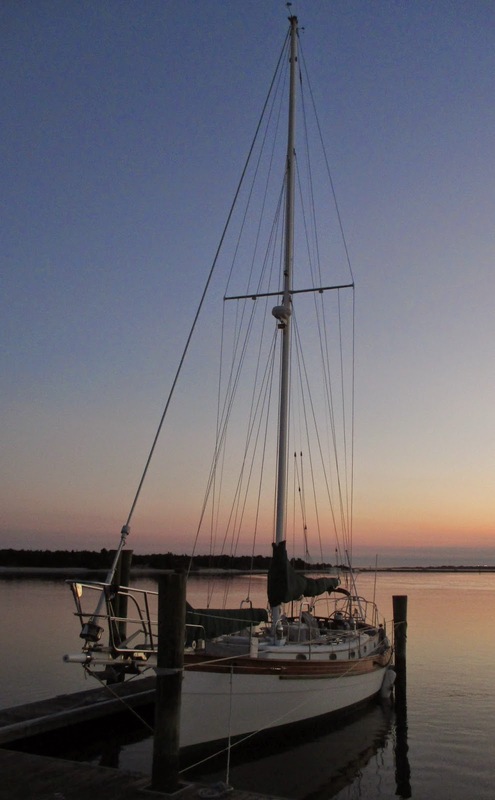 SV (sailing vessel) LAYLA is a blog to help us stay in contact with friends and family as we head out on our voyages. Depending upon access to internet, we will post when we can. It is always great to hear from any readers. Please leave a comment. You can follow us with an automatic notice of a new posting by signing in your email address below. We have begun our adventures on our 43 foot ocean exploration vessel. We hope you will join us on the blog and share the adventures. Layla is a 1985 43' Hans Christian T (traditional). She is hull number 94 of the 43's completed in the King Dragon Boat Yard, Taiwan. Named originally Velvet Swan by her first owners, we are the 4th owners and pleased the second previous owners chose a name that suits her very well.